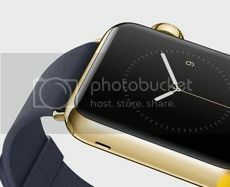 Discussion in 'Apple Watch' started by mcfinch, Sep 17, 2014. One known button. Are you talking about the possible small one on the opposite Crown side? It may be a speaker/mic/sensor or mute button. Apple didn't say what it is and it is very small. The iPhone has a total of 5 buttons: home button, sleep/wake button, ring/silent switch and volume up and down buttons. They obviously went with two because it helps with usability. The crown rotates and is a button plus there's the dedicated button on the right side below the crown for access to favorites. The Digital Crown is a variation of the click wheel and while a selectable switch by pushing in it's not called and I wouldn't call it a button. Again there is something on the opposite side of the Watch that the OP may be asking about. If you watch the Apple Watch intro video, at about 4:20 you'll see that the speaker is right there. The Digital Crown is a variation of the click wheel and while a selectable switch by pushing in it's not called and I wouldn't call it a button. Then the button beneath the crown is the 2nd button, which brings up your contacts / favorites. Yes, the 2nd button resembles the sleep/wake button we all have on our iPhones in term of design (but not function) and some of us use this button 50x a day to sleep our iPhones before pocketing them. "...You can also push it like a button to return to the Home screen,..."
digital crown is in a weird place and there is another button underneath it. Don't forget the touchscreen that accepts swiping, tapping, and "pushing". Include the crown and second button, and I think the interface is a bit complicated for a watch. Watches are supposed to provide a quick glanceable experience. I don't think people want to be looking at a watch face for more than 10-15 seconds (look at your wrist and count to 10, it's a long time). If the interface requires more than that amount of time, I'm taking out my phone. Watches are supposed to provide a quick glanceable experience. I don't think people want to be looking at a watch face for more than 10-15 seconds (look at your wrist and count to 10, it's a long time). If the interface requires more than that amount of time, I'm taking out my phone. That's exactly what it's designed for. Screen notification on the wrist and you'll know whether or not you need to take your iPhone out. Is it? Because of all the things shown, notifications were a small portion. Most of it was ridiculous things like maps, photos, sending heartbeats, and drawing. If they didn't have the killer feature, they should have designed it for notifications and working out and absolutely nothing else. Nail those two things, then add later. That has been the apple way. This watch is more Samsung than apple. Throw a bunch of crap against the wall and see what sticks. I didn't say it's all it is capable of. Obviously Apple Pay and turn by turn NAV are major features. Screen notifications are a big convenience in determining whether you need to take your iPhone out of the pocket. I think apple pay has potential to be a major feature. I think turn by turn is a stretch. I maintain that a watch is useful for short quick tasks and info. But what Apple's vision appears to be is a 1.5" computer, which requires the complication of all the different ways of input. I don't think that ends up being attractive to most people. Walking to an unknown destination and having the aWatch 'haptic' your turns while never having to look at your aWatch so you just look like you know where you are sounds fantastic (and safer). I disagree about turn by turn being a stretch. Not having to fumble with my iPhone while driving is a major convenience. You can't be serious. You are trying to tell me a buzz on your wrist is better than audio directions from the phone along with a map? In a car? Come on, be realistic. Not to mention the idea of haptic feedback actually being able to tell you which way to turn is unproven to say the least. Sure they may be able to demo it but let's see it in real world use. You guys can't see past your own desire for this thing to be great. You are stretching is usefulness. There's audio directions along with a map on the wrist too. No more fumbling with the iPhone. Sorry you can't see its usefulness. I have a Garmin's 620 GPS running watch. It has haptic feedback. It buzzes one pattern on the mile mark and another for each 100 calories and 3ed way to inform me of recovery. I have no trouble recognizing while running. I KNOW I would have no trouble with an aWatch since it would have better haptic feedback engine than my Garmin. Haptic feedback IS proven to me several times every week in "the real world use". So let me get this straight. You contend that it is more convenient to use a 1.5" screen with tiny speaker for turn by turn in a car than a 4-5.5" screen with louder speaker that is likely already using your cart speakers? I'll say again, you aren't being realistic. You may have a case for walking directions, although I would contend few people actually use turn by turn for walking. That's not turn by turn directions. So we have to memorize new patterns for left and right turn? What about a "bank" turn? I have a garmin as well, and haptic feedback for laps and heat rate is not the same as turn left. Maybe it works great. Until I see reviews that confirm that, I'll chalk it up to another gimmick like sending my heartbeat. It's more convenient not having the iPhone out when I can simply glance at my wrist, that's all.